[S26] 1900 United States Federal Census, online , Year: 1900; Census Place: Melrose Ward 2, Middlesex, Massachusetts; Roll: T623_663; Page: 10B; Enumeration District: 878; FHL microfilm: 1240663. [S11] 1910 United States Federal Census, online , Year: 1910; Census Place: Melrose Ward 2, Middlesex, Massachusetts; Roll: T624_602; Page: 10B; Enumeration District: 0940; Image: 1054; FHL microfilm: 1374615. [S949] Unknown author, Massachusetts Deaths 1841-1915 (n.p. : Familysearch,org, unknown publish date), Death Certificate Image. [S3] Ancestry.com, 1840 United States Federal Census (n.p. : Online publication - Provo, UT, USA: Ancestry.com Operations, Inc., 2010. Images reproduced by FamilySearch.Original data - Sixth Census of the United States, 1840. (NARA microfilm publication M704, 580 rolls). Records of the Bureau of the Census, Record G, unknown publish date), Year: 1840; Census Place: Lyons, Wayne, New York; Roll: ; Page: . [S1048] Familysearch.org, New York Probate Files 1829-1921, unknown repository, unknown repository address, "New York, Probate Records, 1629-1971," images, FamilySearch (https://familysearch.org/pal:/MM9.3.1/TH-1951-24585-1508-67 : accessed 08 Sep 2013), Cayuga > Wills 1855-1860 vol L-N > image 208 of 803. "New York Births and Christenings, 1640-1962," database, FamilySearch (https://familysearch.org/ark:/61903/1:1:V2HF-H8G : 11 February 2018), Hans Traber, 17 Mar 1807; citing SAINT PETERS LUTHERAN CHURCH,RHINEBECK,DUTCHESS,NEW YORK, reference ; FHL microfilm 974.733 R1 K28K. [S542] Unknown author, Cayuga County Surrogate's Records (n.p. 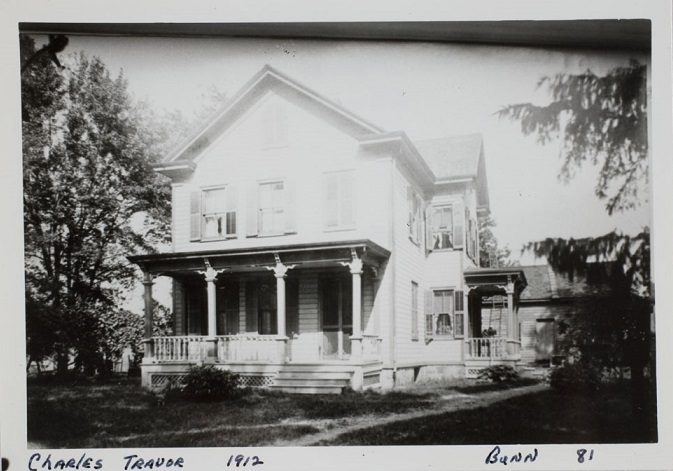 : n.pub., unknown publish date), "New York Probate Records, 1629-1971," images, FamilySearch (https://familysearch.org/ark:/61903/3:1:3QS7-99HB-F4TR : 28 May 2014), Cayuga > Estate papers 1799-1905 box 52 > image 869 of 1160; county courthouses, New York. Birth Year abt 1831 Ulster Co.
Julia Clark married John J Traver, son of Jacob J Traver and Margareth (?). Birth Year: abt 1840 Wayne Co.
[S1174] Oliver C Traver, Birdeen Patten Traver, Shirley Ann Traver Liebrecht Jerome D Traver, The Traver (Treber) family : descendants of John Nicholas Traver Whose sons reached America in 1710 and settled in Columbia and Dutchess Counties, New York (https://dcms.lds.org/delivery/DeliveryManagerServlet Online at LDS Library, 1987), p 47 F35 William H.H. Traver married Sarah Ross, b. 1844, dau of his stepmother. [S1175] Oklahoma Wills an Probate Inexes 1801-2008, online , Book 03-04, 1926-1929; Record of wills, Book 1, 1889-1920. [S9] Ancestry.com, 1860 United States Federal Census (n.p. : Online publication - Provo, UT, USA: Ancestry.com Operations, Inc., 2009. Images reproduced by FamilySearch.Original data - 1860 U.S. census, population schedule. NARA microfilm publication M653, 1,438 rolls. Washington, D.C.: National Archives and Records, unknown publish date), Year: 1860; Census Place: Rhinebeck, Dutchess, New York; Roll: M653_742; Page: 929; Image: 414; Family History Library Film: 803742. [S61] 1930 United States Federal Census, online , Year: 1930; Census Place: Aurelius, Cayuga, New York; Roll: 1411; Page: 11A; Enumeration District: 25; Image: 616.0; FHL microfilm: 2341146. [S62] Ancestry.com, Social Security Death Index (n.p. : Online publication - Provo, UT, USA: Ancestry.com Operations Inc, 2011.Original data - Social Security Administration. Social Security Death Index, Master File. Social Security Administration.Original data: Social Security Administration. Social Security D, unknown publish date), Number: 133-28-8376; Issue State: New York; Issue Date: 1953-1954. Notes: Aug 1953: Name listed as MARGARET ELLEN BUCKLER; 22 May 1998: Name listed as MARGARET E BUCKLER. Margaret E. Traver Charles Traver Myra Tyler. Jane M Traver married Thurston Swenson, son of Hohan Swenson and Esther (?). Bertha H Traver married (?) Burnett. [S26] 1900 United States Federal Census, online , Year: 1900; Census Place: Williamson, Wayne, New York; Roll: T623_1174; Page: 27B; Enumeration District: 129; FHL microfilm: 1241174. George Reberg married George Charles Rehberg. George A Barker married Agnes Carey, daughter of Edward Carey and Caroline Gullen. [S84] The Port Byron Chronicle, Port Byron, NY, Oct 20, 1944: Edward M. Carey, 78, husband of Maude A. Tempest Carey, died at Auburn City hospital Oct. 11, where he had been a patient for the past week. He was born In Rochester and had lived in the Town of Montezuma for the past 60 years. for years he waa an employe of the New York Central railroad and In recent years had operated a farm. He was a Communicant of St. Michael's church and a member of the Holy Name society Mr. Carey is survived by his wife; two daughters. Mrs. John Roulan of Rochester, and Mrs. Viola Williams of Syracuse; two sons, John Carey of Waterloo and Douglas Carey of Port Byron; 10 grandchildren; 21 great-grandchildren; two slaters, Mrs. George Rehberg of Rochester and Mrs. Agnes Barker of Rochester, several nieces and nephews. [S67] Town of Montezuma Records, online http://web.archive.org/web/20020212104157/http://…, (Waybackmachine), May 4, 1914 James William Harmon John M. Harmon Mamie Ferris Ellen Lauretta Carey Edward Carey Maud Tempest. [S67] Town of Montezuma Records, online http://web.archive.org/web/20020212104157/http://…, (Waybackmachine), Sept 8, 1915 John Nugent William Nugent Mary O'Brien Mary Belle Cary Edward Cary Maude Tempest. [S62] Ancestry.com, Social Security Death Index (n.p. : Online publication - Provo, UT, USA: Ancestry.com Operations Inc, 2011.Original data - Social Security Administration. Social Security Death Index, Master File. Social Security Administration.Original data: Social Security Administration. Social Security D, unknown publish date), Number: 117-18-1667; Issue State: New York; Issue Date: Before 1951. Notes Dec 1942: Name listed as CATHERINE VERONICA GILFUS; 31 Dec 1987: Name listed as CATHERINE GILFUS. [S85] Montezuma Birth Records, online <http://web.archive.org/web/20001110085900/http://…>, Nugent, Agnus Mary (f) Dec 22, 1915 John James Nugent (24) Montezuma Mechanic Mary Belle Carey (17) Montezuma 1/1. Notes: Dec 1936: Name listed as MARY AGNES NUGENT; Mar 1971: Name listed as MARY AGN THOMAS; 10 Oct 2002: Name listed as MARY A THOMAS.